In addition to shipping fine art, Fine Art Shippers also provides businesses and individuals with a variety of white glove furniture delivery options. This allows us to offer comprehensive relocation services on the East Coast of the United States and across the country. Plus, we work with many auction houses, as well as auction buyers and sellers, providing them with art pick-up and white glove furniture delivery services of any kind. 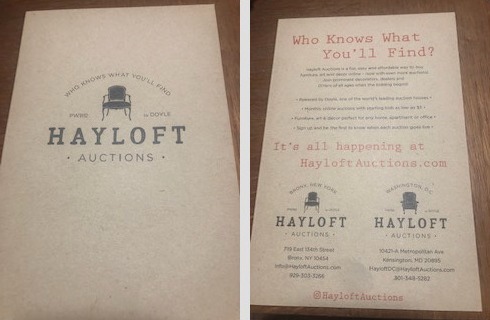 For example, we love working with Doyle Auction House and now want to tell you about Hayloft Auctions, Doyle’s very interesting project that has proven to be a fun and easy way to collect art and antiques. If you are looking for high-quality yet affordable art, décor, or furniture pieces to buy online, you will love Hayloft Auctions by Doyle. Offering an extensive range of collectibles for any taste, it has become a favorite place for many savvy decorators and young collectors from around the country. The selection of items offered by Hayloft Auctions includes different silver objects, porcelain, paintings, vintage books, glassware, mirrors, lamps, furniture, carpets, jewelry, bronzes, and other objects, many with starting prices as low as five dollars. Whatever your budget, you are sure to find something special for your home or office! Whether you are selling or buying merchandise via Hayloft Auctions, and whether you need white glove furniture delivery or any other auction shipping services, Fine Art Shippers would be happy to help!